An all-in-one experience for your unique eyecare needs. Our staff has elite training and expertise to provide you with a premium eye care experience. Everyone is different and we spend the time to ensure your glasses and contacts fit your needs and lifestyle. Soft, disposable, bifocal, gas permeable, or even specialty fits, we have the correct lens for you. We have a huge selection and wide variety of styles from top designer frames at affordable prices. 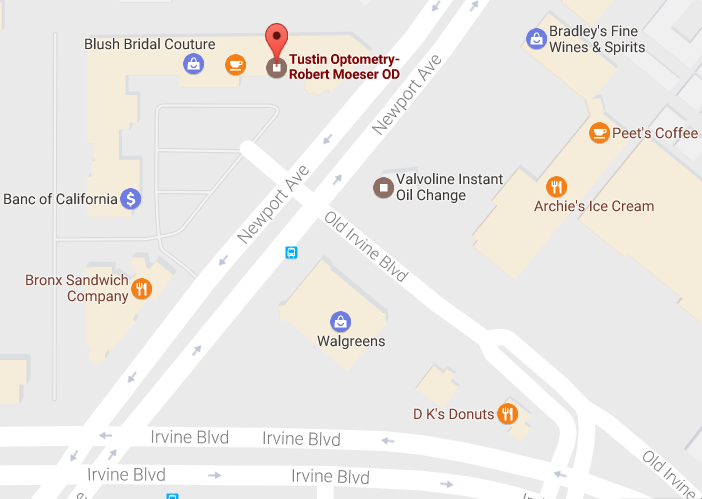 Tustin Optometry is accepting new patients. To schedule an appointment, please call our office at 714-544-5282. 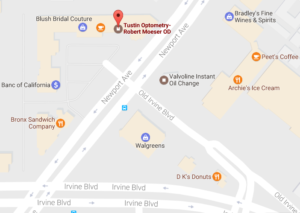 Tustin Optometry is located at, 13011 Newport Ave, #101, Tustin, CA 92780 in the Lafayette Plaza at the corner of Newport Ave. and Irvine Blvd., next to the Tustin Brewing Company. Please find free parking in the main lot or behind the building. Eye exams are by appointment only, but you can stop by to browse our frame selection anytime (new styles arrive monthly)! To learn more or schedule an appointment, please call 714-544-5282. Call us or email us to make an appointment! We take most major eye insurance, call to be sure! Your eye exam will be comprehensive, quick, fun and easy! Need a new or updated frame and/or contact lenses? We have a great selection for you! There’s truly nothing better than being able to see clearly. Our expertise is complete family vision care. With state of the art technology and world-class customer service, our team is committed to providing you with expert eye care. Over 100,000 eyes come to Tustin Optometry. We are excited to welcome you to our practice. Our mission is to not just meet your expectations, but to exceed them! Because we know how much your eye health can mean to the quality of your life, we are committed to excellence in servicing your complete eye care needs. Thank you for choosing us! We participate with VSP, Medicare, Medical Eye Services, Eyemed, Superior Vision, Safeguard, Aetna Vision, Blue Cross PPO. Please check with our staff if you have other types of coverage by calling our office at 714-544-5282. Tustin Optometry accepts FSA dollars for all prescription eyewear purchases (this includes prescription sunglasses and progressives too!) and exams, as long as your FSA or HSA (health savings account) card is affiliated with a major credit card. Better vision is closer than you think! Fill out the form to make an appointment today.